For Texas industry, the drought has brought a conservation focus at many plants, which may have to pay more for future supplies. Last summer, near the height of the most intense drought in recorded Texas history, ConocoPhillips officials grew concerned. The company operates an oil refinery near the southeastern town of Sweeny, and its major water source, the San Bernard River, was getting drier. So ConocoPhillips applied for a permit to tap a well on company land and pipe the water three miles to the plant. Conservation measures at the Sweeny refinery would “not make up for the diminished surface water availability” resulting from the drought, Cynthia Jordy, a ConocoPhillips official, wrote in September to the Coastal Plains Groundwater Conservation District. The district granted the permit last month. 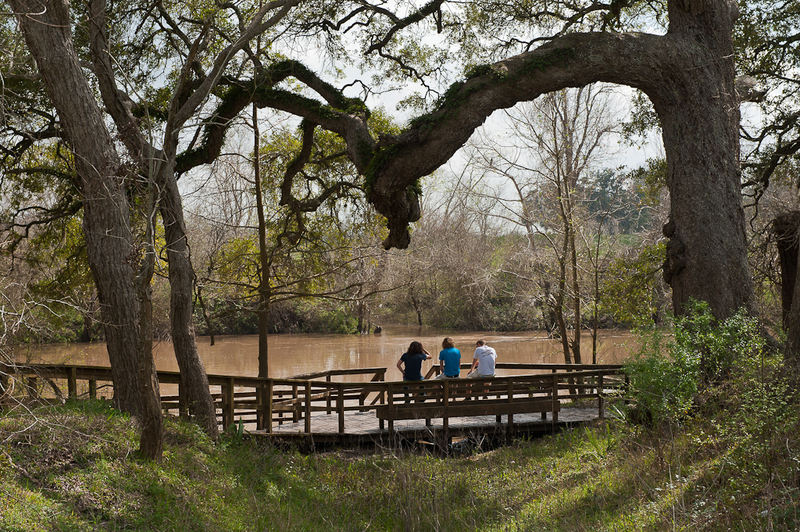 ConocoPhillips was hardly the only industrial plant scrambling to secure more water because of the drought, which still covers more than 90 percent of Texas and has caused many plants to focus more on conservation. As the drought continued, a Formosa Plastics plant along the coast in Point Comfort had its water allocation from Lake Texana cut by as much as 20 percent at one point. The plant paid $1 million to the city of Corpus Christi for additional water during several months last fall, said Gustavo Gonzalez, the city’s water operations director. The City Council is considering another short-term water contract for the plant, Gonzalez said. 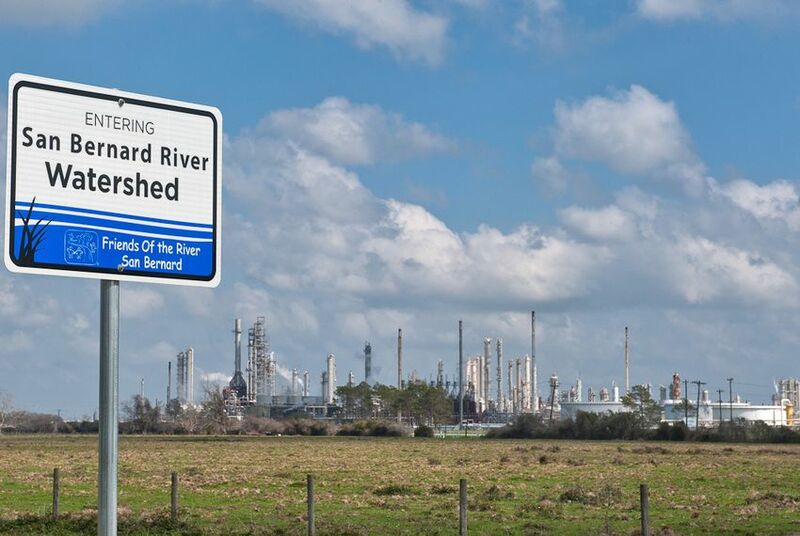 The Sweeny refinery never reduced production either, and the San Bernard River is restored to normal levels, said Rich Johnson, a ConocoPhillips spokesman. “The recent drought reinforced the need to conserve water and diversify water sources for the Sweeny Refinery,” he added in an email. The San Bernard River, February 2012. Gregory Ellis, a lawyer based in League City and a groundwater expert, said industrial plants should make reducing water use a top priority — and prepare to pay more for future supplies. “The era of cheap water is probably coming to an end,” he said. New plants may face extra challenges. In a high-profile case last year, a proposed coal-fired plant in Matagorda County, the White Stallion Energy Center, failed to get a water contract from the Lower Colorado River Authority after an outcry from other river users. But Randy Bird, a plant official, said White Stallion had signed contracts with turf grass growers that should supply enough water for the plant. Another proposed power plant, which would be built near Odessa by Summit Power Group using a cleaner type of coal technology, has also struggled to secure water. This year, however, the company signed a contract to buy brackish groundwater from a landowner and is obtaining desalination prices, said Laura Miller, Summit’s director of Texas projects. Groundwater is exactly where many big plants are looking — and regulators may have a somewhat more difficult time limiting the amount of water that can be withdrawn from wells, thanks to a Texas Supreme Court ruling Friday. When Lake Limestone dipped below 50 percent full last year, NRG Energy wanted to make sure it had enough water for its Limestone County coal plant, which relies on the lake. The urgency has passed. Lake Limestone is 92 percent full, and the supply will last into 2013 at least, Mr. Knox said. But the company has been in talks with the Mid-East Texas Groundwater Conservation District about groundwater permits.